FIRST met him on Market Street in San Francisco. It was a wet and drizzly afternoon, and he was striding along, clad solely in a pair of abbreviated knee trousers and an abbreviated shirt, his bare feet going slick-slick through the pavement slush. At his heels trooped a score of excited gamins. Every head—and there were thousands—turned to glance curiously at him as he went by. And I turned, too. Never had I seen such lovely sunburn. He was all sunburn, of the sort a blond takes on when his skin does not peel. His long yellow hair was burnt; so was his beard, which sprang from a soil unplowed by any razor. He was a tawny man, a golden-tawny man, all glowing and radiant with the sun. Another prophet, thought I, come up to town with a message that will save the world. A few weeks later I was with some friends in their bungalow in the Piedmont Hills overlooking San Francisco Bay. "We've got him, we've got him," they barked. "We caught him up a tree; but he's all right now, he'll feed from the hand. Come on and see him." So I accompanied them up a dizzy hill, and in a rickety shack in the midst of a eucalyptus grove I found my sunburned prophet of the city pavements. He hastened to meet us, arriving in the whirl and blur of a handspring. He did not shake hands with us; instead, his greeting took the form of stunts. He turned more handsprings. He twisted his body sinuously, like a snake, until, having sufficiently limbered up, he bent from the hips, and with legs straight and knees touching, beat a tattoo on the ground with a palm of his hands. He whirligigged and pirouetted, dancing and cavorting around like an inebriated ape. All the sun warmth of his ardent life beamed in his face. I am so happy, was the song without words he sang. He sang it all evening, ringing the changes on it with an endless variety of stunts. "A fool! A fool!" I met a fool in the forest!" thought I. And a worthy fool he proved. Between handsprings and whirligigs he delivered his message that would save the world. It was twofold: First, let suffering humanity strip off its clothing and run wild in the mountains and valleys; and, second, let the very miserable world adopt phonetic spelling. I caught a glimpse of the great social problems being settled by the city populations swarming naked over the landscape, to the popping of shotguns, the barking of ranch dogs, and countless assaults with pitchforks wielded by irate farmers. The years passed, and one sunny morning the Snark poked her nose into a narrow opening in a reef that smoked with the crashing impact of the trade-wind swell, and beat slowly up Papeiti harbor. Coming off to us was a boat flying a yellow flag. We knew it contained the port doctor. But quite a distance off, in its wake, was a tiny outrigger canoe that puzzled us. It was flying a red flag. I studied it through the glasses, fearing that it marked some hidden danger to navigation, some recent wreck or some buoy or beacon that had been swept away. Then the doctor came on board. After he had examined the state of our health and been assured that we had no live rats hidden away in the Snark, I asked him the meaning of the red flag. "Oh, that is Darling," was the answer. And then Darling, Ernest Darling, flying the red flag that is indicative of the brotherhood of man, hailed us. "Hello, Jack!" he called. "Hello, Charmian!" He paddled swiftly nearer, and I saw that he was the tawny prophet of the Piedmont Hills. He came over the side, a sun god clad in the scarlet loin cloth, with presents of Arcady and greeting in both his hands—a bottle of golden honey and a leaf basket filled with great golden mangoes, golden bananas specked with freckles of deeper gold, golden pineapples and golden limes, and juicy oranges minted from the same precious ore of sun and soil. And in this fashion, under the southern sky, I met once more Darling, the Nature Man. Tahiti is one of the most beautiful spots in the world, inhabited by thieves and robbers and liars, also by several honest and truthful men and women. Wherefore, because of the blight cast upon Tahiti's wonderful beauty by the spidery human vermin that infest it, I am minded to write not of Tahiti, but of the Nature Man. He, at least, is refreshing and wholesome. The spirit that emanates from him is so gentle and sweet that it would harm nothing, hurt nobody's feelings save the feelings of a predatory and plutocratic capitalist. "What does this red flag mean?" I asked. "Yes, yes, I know that," I went on; "but what does it mean in your hands?" "Why, that I've found my message." "And that you are delivering it to Tahiti?" I demanded incredulously. "Sure," he answered simply; and later on I found that he was, too. When we dropped anchor, lowered a small boat into the water, and started ashore, the Nature Man joined us. Now, thought I, I shall be pestered to death by this crank. Waking or sleeping, I shall never by quit of him until I sail away from here. But never in my life was I more mistaken. I took a house, and went to live and work in it, and the Nature Man never came near me. He was waiting for the invitation. In the meantime he went aboard the Snark and took possession of her library, delighted by the quantity of scientific books, and shocked, as I learned afterward, by the inordinate amount of fiction. The Nature Man never wastes time on fiction. After a week or so my conscience smote me, and I invited him to dinner at a down-town hotel. He arrived, looking unwontedly stiff and uncomfortable in a cotton jacket. When invited to peel it off, he beamed his gratitude and joy, and did so, revealing his sun-gold skin, from waist to shoulder, covered only by a piece of fish net of coarse twine and large of mesh. A scarlet loin cloth completed his costume. I began my acquaintance with him that night, and during my long stay in Tahiti that acquaintance ripened into friendship. "So you write books," he said one day, when, tired and sweaty, I finished my morning's work. "I, too, write books," he announced. Aha, though I, now at last he is going to pester me with his literary efforts. My soul was in revolt. I had not come all the way to the South Seas to be a literary bureau. "This is the book I write," he explained, smashing himself a resounding blow on the chest with his clenched fist. "The gorilla in the African jungle pounds his chest till the noise of it can be heard half a mile away." "A pretty good chest," quoth I admiringly; "it would make even a gorilla envious." And then, and later, I learned the details of the marvelous book Ernest Darling had written. Twelve years ago he lay close to death. He weighed by ninety pounds and was too weak to speak. The doctors had given him up. His father, a practising physician, had given him up. Consultations with other physicians had been held upon him. There was no hope for him. Overstudy (as a schoolteacher and as a university student) and two successive attacks of pneumonia were responsible for his breakdown. Day by day he was losing strength. He could extract no nutrition from the heavy foods they gave him; nor could pellets and powders help his stomach to do the work of digestion. Not only was he as physical wreck, but he was a mental wreck. His mind was overwrought. He was sick and tired of medicine, and he was sick and tired of persons. Human speech jarred upon him. Human attentions drove him frantic. The thought came to him that since he was going to die, he might as well die in the open, away from all the bother and irritation. And behind this idea lurked a sneaking idea that perhaps he would not die, after all, if only he could escape from the heavy foods, the medicines, and the well-intentioned persons who made him frantic. So Ernest Darling, a bag of bones and a death's head, a perambulating corpse with just the dimmest flutter of life in it to make it perambulate, turned his back upon men and the habitations of men and dragged himself for five miles through the brush, away from the city of Portland, Oregon. Of course he was crazy. Only a lunatic would drag himself out of his death bed. But in the brush Darling found what he was looking for—rest. Nobody bothered him with beef-steaks and pork. No physicians lacerated his tired nerves by feeling his pulse, nor tormented his tired stomach with pellets and powders. He began to feel soothed. The sun was shining warm, and he basked in it. He had the feeling that the sunshine was an elixir of health. Then it seemed to him that his whole wasted wreck of a body was crying for the sun. He stripped off his clothes and bathed in the sunshine. He felt better. It had done him good—the first relief in weary months of pain. As he grew better he sat up and began to take notice. All about him were the birds fluttering and chirping, the squirrels chattering and playing. He envied them and their health and spirits, their happy, carefree existence. That he should contrast their condition with his was inevitable; and that he should question why they were splendidly vigorous while he was a feeble, dying wraith of a man was likewise inevitable. His conclusion was the very obvious one—namely, that they lived naturally, while he lived most unnaturally; therefore, if he intended to live, he must return to Nature. Alone, there in the brush, he worked out his problem and began to apply it. He stripped off his clothing and leaped and gamboled about, running on all fours, climbing trees, in short doing physical stunts—and all the time soaking in the sunshine. He imitated the animals. He built a nest of dry leaves and grasses in which to sleep at night, covering it over with bark as a protection against the early fall rains. "Here is a beautiful exercise," he told me once, flapping his arms mightily against his sides. "I learned it from watching the roosters crow." Another time I remarked the loud, sucking intake with which he drank cocoanut milk. He explained that he had noticed the cows drinking that way, and concluded there must be something in it. He tried it and found it good, and thereafter he drank only in that fashion. He noted that the squirrels lived on fruits and nuts. He started on a fruit-and-nut diet, helped out by bread, and he grew stronger and put on weight. For three months he continued his primordial existence in the brush, and then the heavy Oregon rains drove him back to the habitations of men. Not in three months could a ninety-pound survivor of two attacks of pneumonia develop sufficient ruggedness to live through an Oregon winter in the open. He had accomplished much, but he had been driven in. There was no place to go but back to his father's house, and there, living in close rooms with lungs that panted for all the air of the open sky, he was brought down by a third attack of pneumonia. He grew weaker even than before. In that tottering tabernacle of flesh his brain collapsed. He lay like a corpse, too weak to stand the fatigue of speaking, too irritated and tired in his miserable brain to care to listen to the speech of others. The only act of will of which he was capable was to stick his fingers in his ears and resolutely to refuse to hear a single word that was spoken to him. They sent for the insanity experts. He was adjudged insane, and also the verdict was given that he would not live a month. By one such mental expert he was carted off to a sanatorium on Mount Tabor. Here, when they learned that he was harmless, they gave him his own way. They no longer dictated as to the food he ate, so he resumed is fruits and nuts—olive oil, peanut butter and bananas were the chief articles of his diet. As he regained his strength he made up his mind to leave thenceforth his own life. If he lived like others, according to social conventions, he would surely die. And he did not want to die. The fear of death was one of the strongest factors in the genesis of the Nature Man. To live he must have a natural diet, the open air and the blessed sunshine. Now, an Oregon winter has no inducements for those who wish to return to Nature, so Darling started out in search of a climate. He mounted a bicycle and headed south for the sun lands. Stanford University claimed him for a year. Here he studied and worked his way, attending lectures in as scant garb as the authorities would allow and applying as much as possible the principles of living that he had learned in squirrel town. His favorite method of study was to go off in the hills back of the university, and there to strip off his clothes and lie on the grass, soaking in sunshine and health at the same time that he soaked in knowledge. But central California has her winters, and the quest for a Nature man's climate drew him on. He tried Los Angeles and southern California, being arrested a few times and brought before the insanity commissions, because, forsooth, his mode of life was not modeled after the mode of life of his fellow-men. He tried Hawaii, where, unable to prove him insane, the authorities deported him. It was not exactly a deportation. He could have remained by serving a year in prison. They gave him his choice. New, prison is death to the Nature Man, who thrives only in the open air and in God's sunshine. The authorities of Hawaii are not to be blamed. Darling was an undesirable citizen. Any man is undesirable who disagrees with one. And that any man should disagree to the extend Darling did in his philosophy of the simple life is ample vindications of the Hawaiian authorities' verdict of his undesirableness. So Darling went thence in search of a climate which would not only be desirable, but wherein he would not be undesirable. And he found it in Tahiti, the garden spot of garden spots. And so it was, according to the narrative as given, that he wrote the pages of his book. He wears only a loin cloth and a sleeveless fish-net shirt. His stripped weight is one hundred and sixty-five pounds. His health is perfect. His eyesight, that at one time was considered ruined, is excellent. The lungs, that were practically destroyed by three attacks of pneumonia, have not only recovered, but are stronger than ever before. I shall never forget the first time, while talking to me, that he squashed a mosquito. The stinging pest had settled in the middle of his back between his shoulders. Without interrupting the flow of conversation, without dropping even a syllable, his clenched fist shot up on the air, curved backward, and smote his back between the shoulders, killing the mosquito and making his frame resound like a bass drum. It reminded me of nothing so much as horses kicking the woodwork in the stalls. "The gorilla in the African jungle pounds his chest until the noise of it can be heard half a mile away," he will announce suddenly, and thereat beat a hair-raising devil's tattoo on his own chest. One day he noticed a set of boxing gloves on the wall, and promptly his eyes brightened. "Do you box?" I asked. "I used to give lessons in boxing when I was at Stanford," was the reply. And then and there we stripped and put on the gloves. Bang! a gorilla arm flashed out, landing the gloved end on my nose. Biff! he caught me, in a duck, on the side of the head, nearly knocking me over sidewise. I carried the lump raised by that blow for a week. I ducked under a straight left, and landed a straight right on his stomach. It was a fearful blow. The whole weight of my body was behind it and his body had been met as it lunged forward. I looked for him to crumple up and go down. Instead of which his face beamed approval, and he said, "That was beautiful." The next instant I was covering up and striving to protect myself from a hurricane of hooks, jolts and upper cuts. Then I watched my chance and drove in for the solar plexus. I hit my mark. The Nature Man dropped his arms, gasped, and sat down suddenly. "I'll be all right," he said. "Just wait a moment." And inside thirty seconds he was on his feet—aye, and returning the compliment, for he hooked me in the solar plexus, and I gasped, dropped my hands, and sat down just a trifle more suddenly than he had. All of which I submit as evidence that the man I boxed with was a totally different man from the poor, ninety-pound weight of twelve years before, who, given up by physicians and alienists, lay gasping his life away in a closed room in Portland, Oregon. The book that Ernest Darling has written is a good book, and the binding is good, too. Hawaii has wailed for years her need for desirable immigrants. She has spent much time, and thought, and money, in importing desirable citizens, and she has, as yet, nothing much to show for it. Yet Hawaii deported the Nature Man. She refused to give him a chance. So it is, to chasten Hawaii's proud spirit, that I take this opportunity to show her what she has lost in the Nature Man. 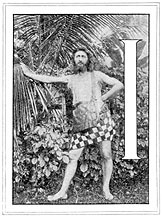 When he arrived in Tahiti he proceeded to seek out a piece of land on which to grow the food he ate. But land was difficult to find—that is, inexpensive land. The Nature Man was not rolling in wealth. He spent weeks in wandering over the steep hills, until, high up the mountain, where clustered several tiny cañons, he found eighty acres of brush jungle which were apparently unrecorded as the property of any one. The government officials told him that if he would clear the land and till it for thirty years he would be given a title for it. Immediately he set to work. And never was there such work. Nobody farmed that high up. The land was covered with matted jungle and overrun by wild pigs and countless rats. The view of Papeiti and the sea was magnificent, but the outlook was not encouraging. He spent weeks in building a road in order to make the plantation accessible. The pigs and the rats ate up whatever he planted as fast as it sprouted. He shot the pigs and trapped the rats. Of the latter he quickly caught fifteen hundred. Everything had to be carried up on his back. He usually did his pack-horse work at night. Gradually he began to win out. A grass-walled house was built. On the fertile volcanic soil he had wrested from the jungle and the jungle beasts were growing five hundred cocoanut trees, five hundred papaia trees, three hundred mango trees, many breadfruit trees and alligator-pear trees, to say nothing of vines, bushes and vegetables. He developed the drip of the hills in the cañons and worked out an efficient irrigation scheme, ditching the water from cañon to cañon and paralleling the ditches at different altitudes. His narrow cañons became botanical gardens. The arid shoulders of the hills, where formerly the blazing sun had parched the jungle and beaten it close to the earth, blossomed into trees and shrubs and flowers. 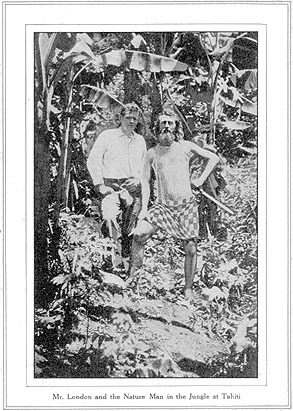 Not only had the Nature Man become self-supporting, but he was now a prosperous agriculturist with produce to sell to the city dwellers of Papeiti. Then it was discovered that his land, which the government officials had informed his was without an owner, really had an owner, and that deeds, descriptions, etc., were on record. All his work bade fair to be lost. The land had been valueless when he took it up, and the owner, a large landholder, was unaware of the extent to which the Nature Man had developed it. A just price was agreed upon, and Darling's deed was officially filed. Next came a more crushing blow. Darling's access to the market was destroyed. The road he had built was fenced across by triple barb-wire fences. It was one of those jumbles in human affairs that is so common in this absurdest of social systems. Behind it was the fine hand of the same conservative element that haled the Nature Man before the Insanity Commission in Los Angeles and that deported him from Hawaii. It is so hard for self-satisfied men to understand any man whose satisfactions are fundamentally different. It seems clear that the officials have connived with the conservative element, for to this day the road the Nature Man built is closed; nothing has been done about it, while an adamant unwillingness to do anything about it is evidenced on every hand. But the Nature Man dances and sings along his way. He does not sit up nights thinking about the wrong which has been done him; he leaves the worrying to the doers of the wrong. He has no time for bitterness. He believes that he is in the world for the purpose of being happy, and he has not a moment to waste in any other pursuit. The road to his plantation is blocked. He cannot build a new road, for there is no ground on which he can build it. The government has restricted him to a wild-pig trail which runs precipitously up the mountain. I climbed the trail with him, and we had to climb with hands and feet in order to get up. Nor can that wild-pig trail be made into a road by any amount of toil less than that of an engineer, a steam engine and a steel cable. But what does the Nature Man care? In his gentle ethics, the evil men do him he requites with goodness. Who shall say he is not happier than they? "Never mind their pesky road," he said to me as we dragged ourselves up a shelf of rock, and sat down, panting, to rest. "I"ll get an air machine soon, and fool them. I'm clearing a level space for a landing stage for the airships, and next time you come to Tahiti you will alight right at my door." Yes, the Nature Man has some strange ideas besides that of the gorilla pounding his chest in the African jungle. The Nature Man has ideas about levitation. "Yes, sir," he said to me, "levitation is not impossible. And think of the glory of it—lifting oneself from the ground by an act of will. Think of it! The astronomers tell us that our whole solar system is dying, that, barring accidents, it will all be so cold that no life can live upon it. Very well. In that day all men will be accomplished levitationists, and they will leave this perishing planet and seek more hospitable worlds. How can levitation be accomplished? By progressive fasts. Yes, I have tried them, and toward the end I could feel myself actually getting lighter." The man is a maniac, thought I. "Of course," he added, "these are only theories of mine. I like to speculate upon the glorious future of man. Levitation may not be possible, but I like to think of it as possible." One evening, when he yawned, I asked him how much sleep he allowed himself. "Seven hours," was the answer. "But in ten years I'll be sleeping only six hours, and in twenty years only five hours. You see, I shall cut off an hour's sleep every ten years." "Then when you are a hundred you won't be sleeping at all." I interjected. "Just that. Exactly that. When I am a hundred I shall not require sleep. Also, I shall be living on air. There are plants that live on air, you know." "But has any man ever succeeded in doing it?" "I never heard of him if he did. But it is only a theory of mine, this living on air. It would be fine, wouldn't it? Of course it may be impossible—most likely it is. You see, I am not unpractical. I never forget the present. When I soar ahead into the future I always leave a string by which to find my way back again." I fear me the Nature Man is a joker. At any rate, he lives the simple life. His laundry bill cannot be large. Up on his plantation he lives on fruit the labor cost of which in cash he estimates at five cents a day. At present, because of his obstructed road and because he is head over heels in the propaganda of socialism, he is living in town, where his expenses, including rent, are twenty-five cents a day. In order to pay those expenses he is running a night school for Chinese. The Nature Man is not bigoted. When there is nothing better to eat than meat, he eats meat, as, for instance, when in jail or on shipboard and the nuts and fruits give out. Nor does he seem to crystallize into anything except sunburn. "'Drop anchor anywhere and the anchor will drag—that is, if your soul is a limitless, fathomless sea, and not a dog pound,'" he quoted to me; then added, "You see, my anchor is always dragging. I live for human health and progress, and I strive to drag my anchor always in that direction. To me the two are identical. Dragging anchor is what has saved me. My anchor did not hold me to my death bed. I dragged anchor into the brush and fooled the doctors. When I recovered health and strength I started by preaching and example to teach the people to become Nature men and Nature women. But they had deaf ears. Then, on the steamer coming to Tahiti, a quartermaster expounded socialism to me. He showed me that an economic square deal was necessary before men and women could live naturally. So I dragged anchor once more, and now I am working for the co-operative commonwealth. When that arrives it will be easy to bring about Nature living. "I had a dream last night," he added thoughtfully, his face slowly breaking into a glow. "It seemed that twenty-five Nature men and Nature women had just arrived on the steamer from California, and that I was starting to go with them up the wild-pig trail to the plantation." Ah, me, Ernest Darling, sun worshiper and Nature man, there are times when I am compelled to envy you and your care-free existence. I see you now, dancing up the steps and cutting up antics on the veranda; your hair dripping from a plunge in the salt sea, your eyes sparkling, your sun-gilded body flashing, your chest resounding to the devil's own tattoo as you chant, "The gorilla in the African jungle pounds his chest until the noise of it can be heard half a mile away." And I shall see you always as I saw you that last day, when the Snark poked her nose once more through the passage in the smoking reef, outward bound, and I waved good-by to those on the shore. Not least in good will and affection was the wave I gave to the golden sun god in the scarlet loin cloth, standing upright in his tiny outrigger canoe. From the September, 1908 issue of Woman's Home Companion magazine.